The Brazilian Government says it has secured another big price cut on a key drug for treating Aids patients. The deal to buy Efavirenz from the Merck pharmaceutical company at 25% off will save the country $10m a year. Last week, Brazil announced that it had negotiated a 76% reduction in the price of another drug, Atazanavir. Brazil has spearheaded an international campaign to force down the price of anti-retroviral medication, which it offers free to patients. The number of Aids-related deaths in Brazil has fallen by half since the government began free distribution of the drugs in 1997. Brazil has put pressure on pharmaceutical companies to reduce their drug prices by threatening to make generic copies locally if they do not oblige. The health ministry in Brasilia said it had reached the agreement with Merck to buy Efavirenz at a discount after long negotiations. 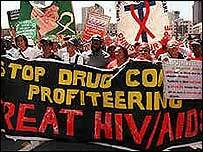 Efavirenz accounts for nearly one-fifth of the money that Brazil spends on its cocktail of 15 anti-Aids drugs. The announcement comes less than a week after the ministry concluded a deal with Bristol-Myers Squibb to buy Atazanavir at 76% off, representing a saving of more than $60m a year. The health ministry said it was continuing talks with two other drug companies in an effort to negotiate further price reductions. These are Roche, which produces Nelfinavir, and Abbott, which manufactures Lopinavir. Last month, the Brazilian Government launched a national campaign to encourage more people to take HIV tests. It is estimated that 600,000 Brazilians are HIV-positive, but two-thirds of them are carrying the virus without realising it.